First-time mom Shannon Pierce was taking photos of her three-month-old daughter Olivia when she noticed a strange reflection in her eyes after the photos developed. During her daughter's next appointment, Olivia was diagnosed with bilateral retinoblastoma - cancer in both eyes. Within a week of diagnosis, she received her first surgery and began an aggressive chemotherapy regimen, one that would last for years. As the Pierce family began their harrowing battle with childhood cancer, a social worker at the children's hospital put them in contact with The National Children's Cancer Society (NCCS). "The first phone call I made to NCCS," Shannon said, "turned out to be the ultimate lifeline in dealing with my newborn daughter's cancer. NCCS was an outlet to share all my emotions with other parents who knew exactly what I was going through every step of the way." NCCS helped the Pierce family by providing assistance with hospital parking fees, meals, fuel and hotels when needed. "NCCS gave us the financial support we needed to ease our minds of stress and worry so we could focus all of our attention on Olivia," said Shannon. Five years after her original diagnosis, Olivia has undergone more than 30 surgeries and continues to receive regular treatment every six months for two inactive tumors in her right eye. Though chemotherapy was successful in shrinking the tumors in Olivia's right eye, her left eye was beyond saving and removed. 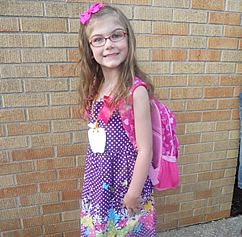 She now uses a prosthetic and her family is thankful that no new tumors have been detected. Despite the removal of one of her eyes, Olivia continues to learn and play like most healthy children. She loves to draw, paint, swim and cheer on her home football team, the Indianapolis Colts. As a competitive young cheerleader, she demonstrates her confidence and bravery both on and off the field. Olivia and her family share her story at various events that encourage support for organizations like NCCS that support pediatric cancer. "Through all the darkness that cancer can bring, NCCS was the light to help us shine through," writes the Pierce family. "We are so thankful for everything NCCS has done for Olivia. We cannot imagine our incredible journey without their help."